Protest After Protest: Does Anyone Really Care About Students in South Central? Teachers from all over California are desperately trying to bring attention to what we know will be the devastating impact of teacher layoffs which will result in drastic class size increases. We know, as parents in public schools do, that quality public education cannot survive when students are piled into classrooms at 45 students per teacher. 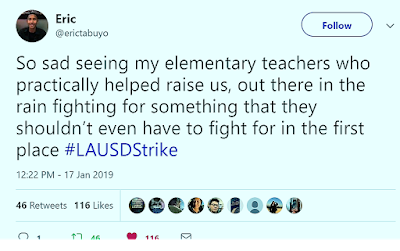 We are not asking for raises.We are not asking for concessions.We want to be able to teach your children, touch their lives, and make a difference in this world. 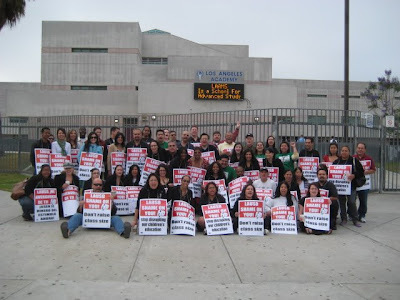 Public, please don't let the LAUSD school board cut classrooms as their way of balancing the budget. Let them know that teachers in the classroom should be the last prescious resource to go, if anything must go at all.